Discover the future of lighting with a vintage look with the Enbrighten Vintage Series LED Café Lights. Enbrighten Café Lights deliver warm white, attractive light and unprecedented energy efficiency with a light source you never have to replace. Featuring commercial grade construction with premium design inspired by the cafés of Paris and classic Edison-style aesthetics to create a perfect ambiance in any indoor/outdoor space. Perfect for patios, pergolas, gazebos, home accents, parties, and camping. Vintage Series: Commercial grade construction with premium design inspired by the cafés of Paris and classic Edison-style aesthetics to create a perfect ambience in any indoor/outdoor space. Linkable up to 350 feet. 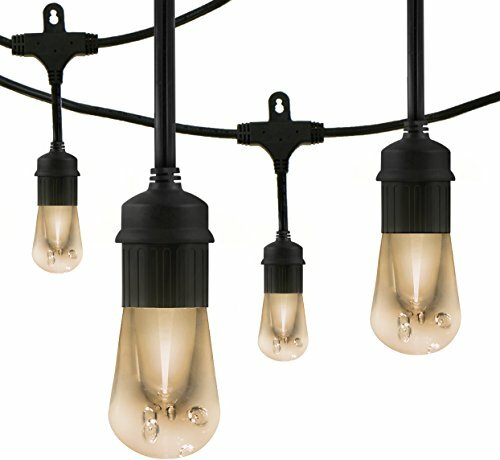 Each strand of Enbrighten Café Lights has end-to-end connections, so you can link multiple sets to achieve the perfect length for any installation. If you have any questions about this product by Enbrighten, contact us by completing and submitting the form below. If you are looking for a specif part number, please include it with your message.